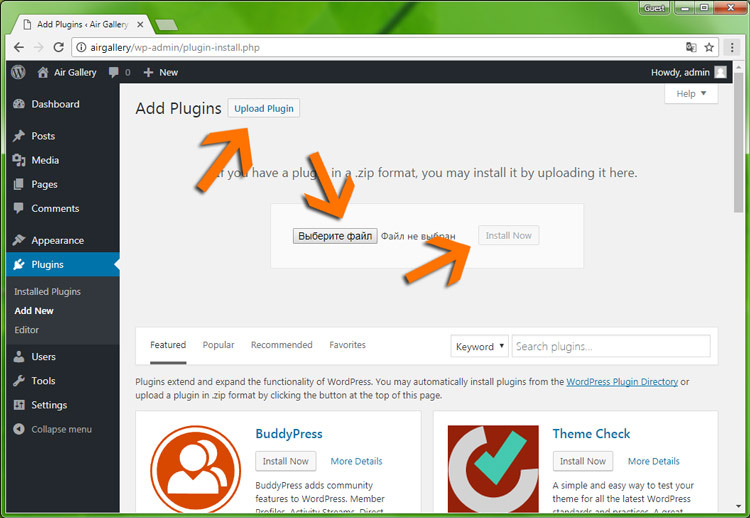 The installation of the plug-in is standard, and does not differ from the installation of other plug-ins. 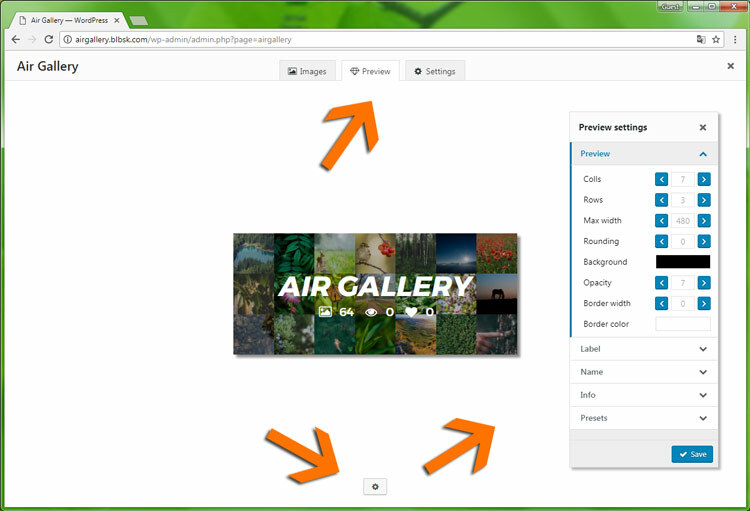 To create a new gallery click on the button "Create new Air Gallery"
Gallery settings are located in the "Settings" tab. Copy shkodkod for adding to the record. 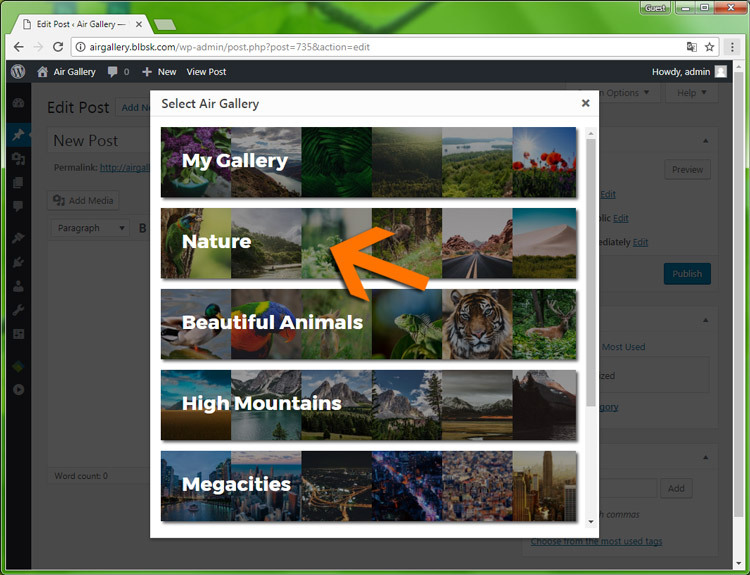 To add images to the gallery, click the "Add images to Air Gallery" button. 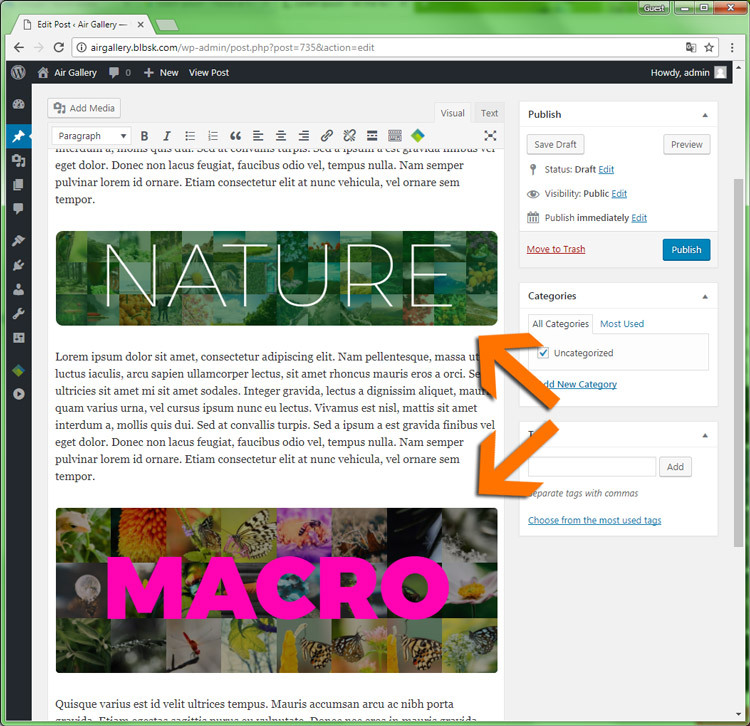 You will see a window of the standard WordPress library. All previously uploaded images are displayed here. 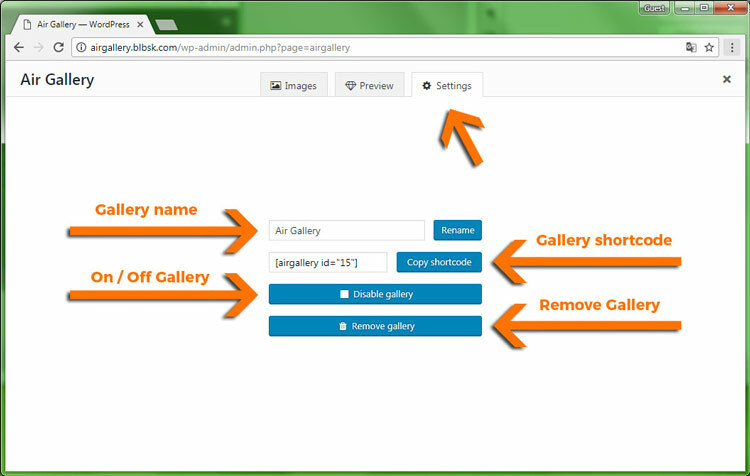 Mark the images you want to add to the gallery and click on the "Add to Air Gallery"
You can also upload new images to the library. 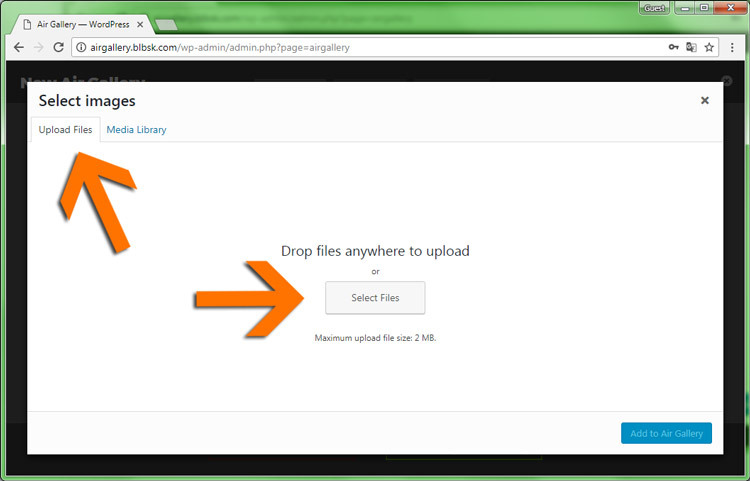 Just go to the "Upload files" tab, click the "Select Files" button and upload new images. Done! Images have been added to the gallery. 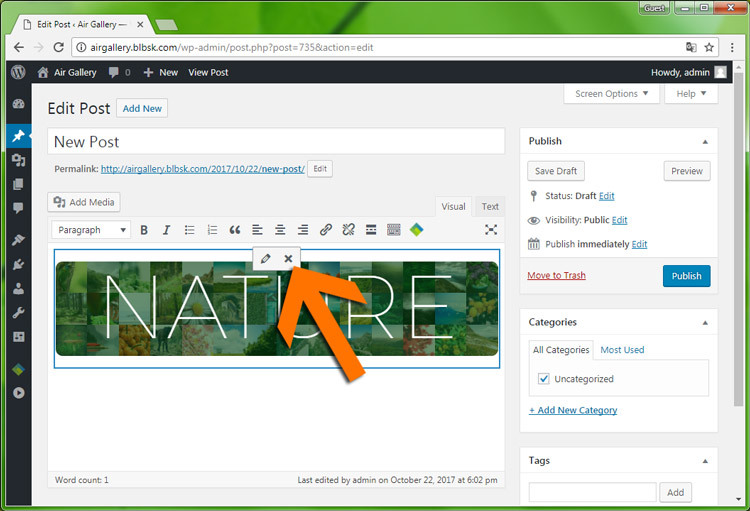 When you add images, duplicates will be skipped. 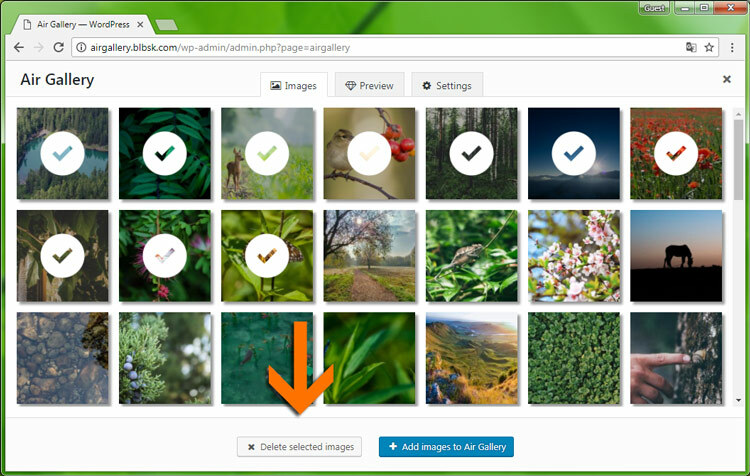 and click on the "Delete selected images"
You can also delete an image directly while viewing. Just click on the basket icon in the lower left corner. Important information! 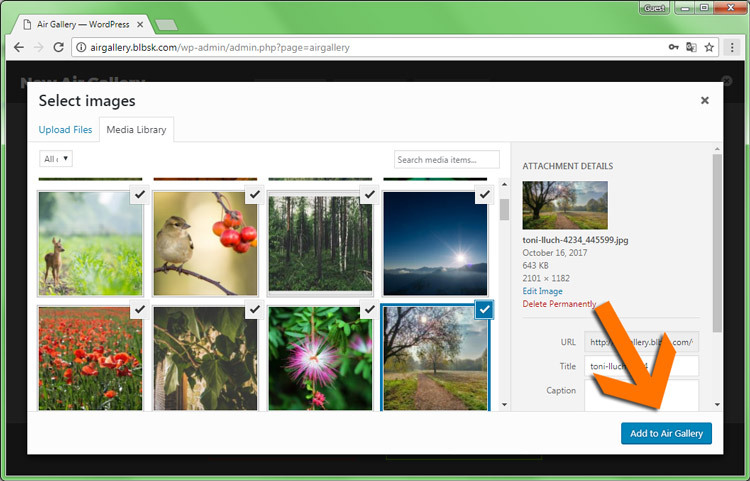 When you delete images from a gallery, images are not physically deleted. They are deleted only from the current gallery. 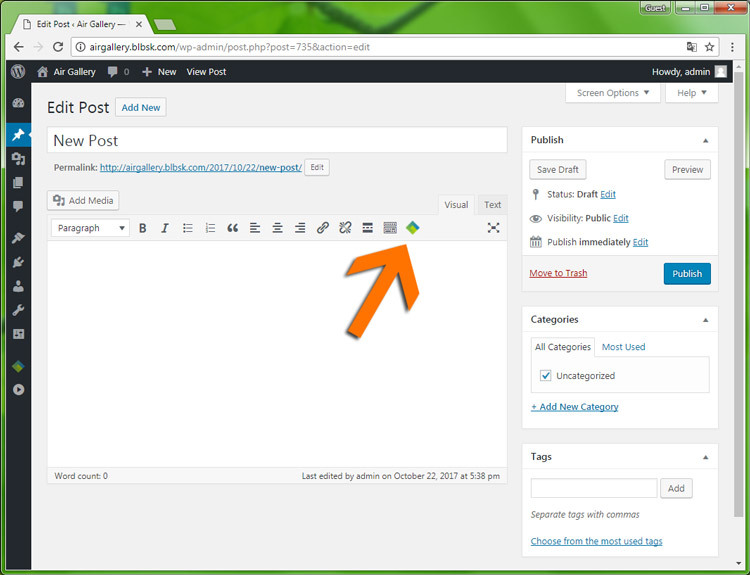 After the removal of the image is still available in the library wordpress. And you can add them again to the gallery. 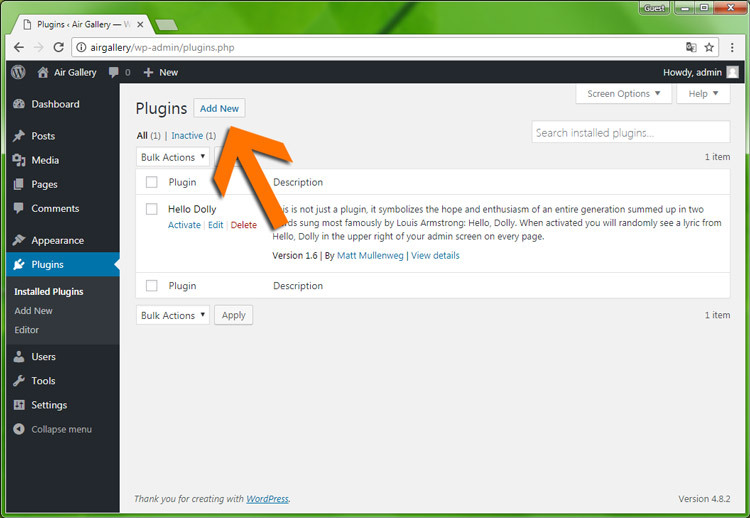 To customize the preview, go to the "Preview" tab, and click on the gear at the bottom of the page. The window with settings for customizing the preview will open. 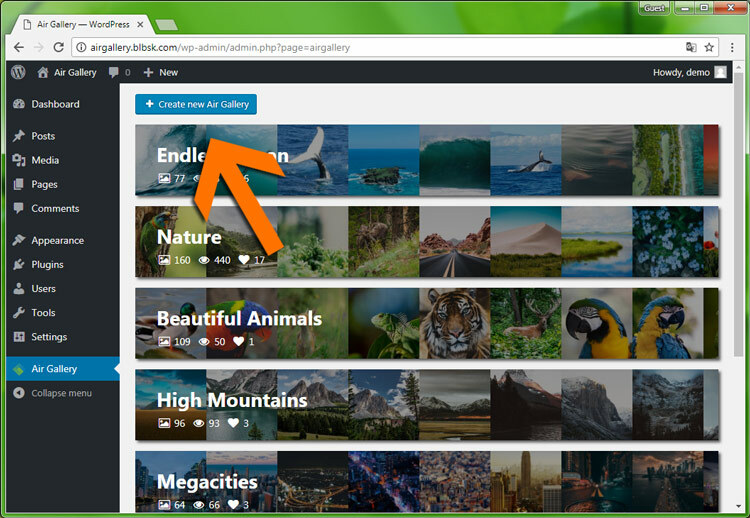 This video shows an example of customizing gallery previews. 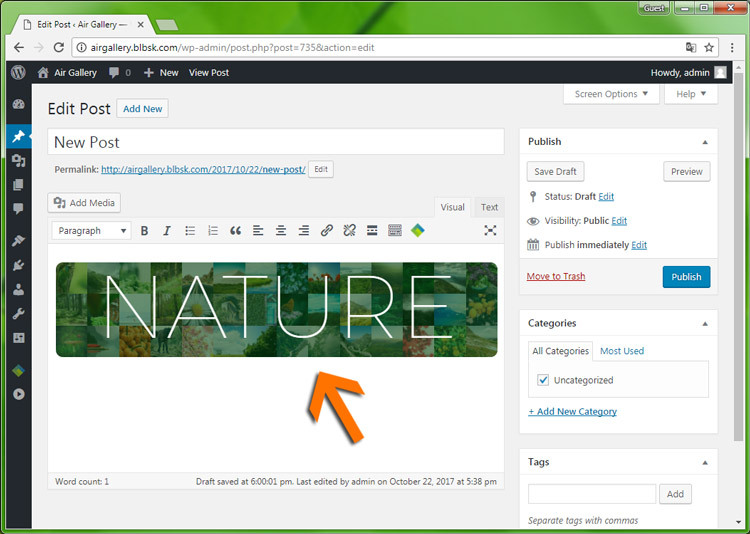 To insert a gallery into the record, there is a separate button in the edit panel of the entry. 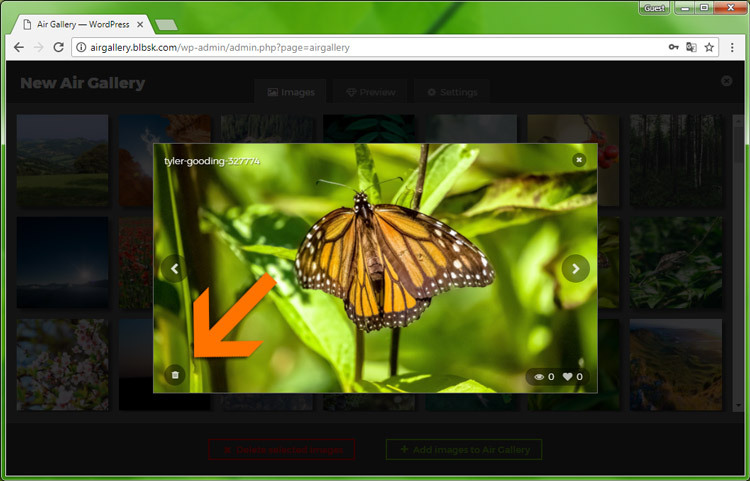 Clicking this button will pop up a window with a list of all available galleries. Click on any gallery to add it to the post. 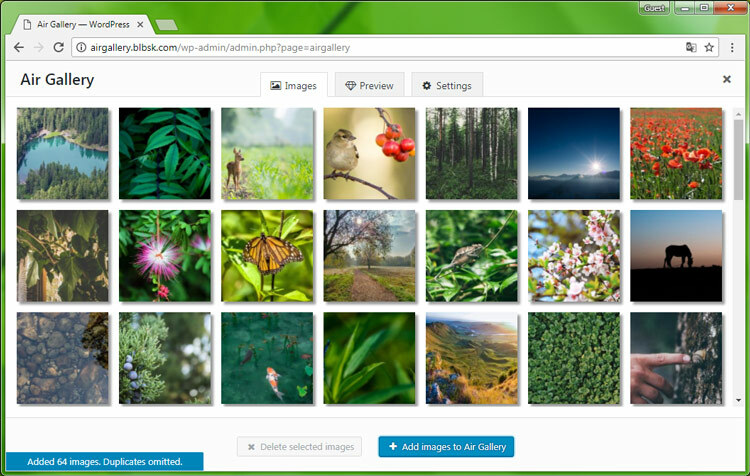 You can add several galleries to the post. 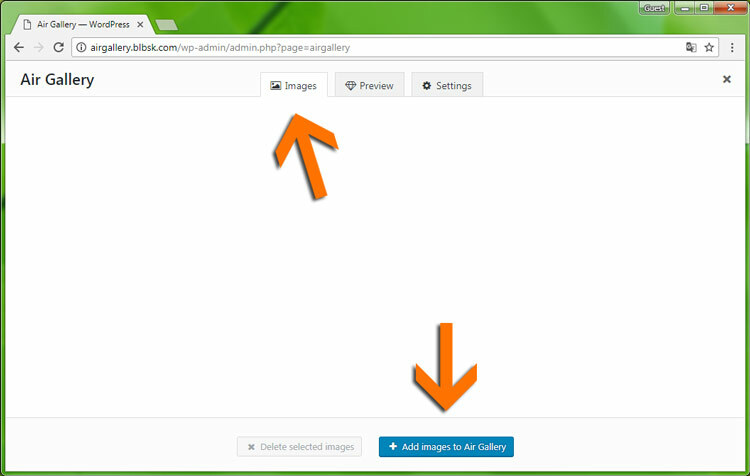 To remove the gallery from the entry, click on the preview and click the cross.